Defqon.1 Warriors, we stand on the verge of a memorable milestone. We are beyond thrilled to embark on a journey that is a decade strong together, and step into our 10-year anniversary of Defqon.1 in Australia with YOU. The moment to pay tribute to our legacy and celebrate this landmark in Hardstyle history has come. With a multitude of areas spread across the holy grounds of our ultimate party island, you’ll face our signature stronghold; it is MAXIMUM FORCE! Warning: If buying tickets from the secondary market, we recommend the following in order to protect you from buying authentic tickets only. Do NOT purchase any tickets from online market places or re-sellers like Viagogo or Stubhub. Any tickets offered on these sites are based on market speculation, and in most cases you won’t even receive your ticket, or tickets are duplicates. So please stay away from these sites for your own protection. Do NOT purchase any secondary PDF (Print @ Home) tickets. 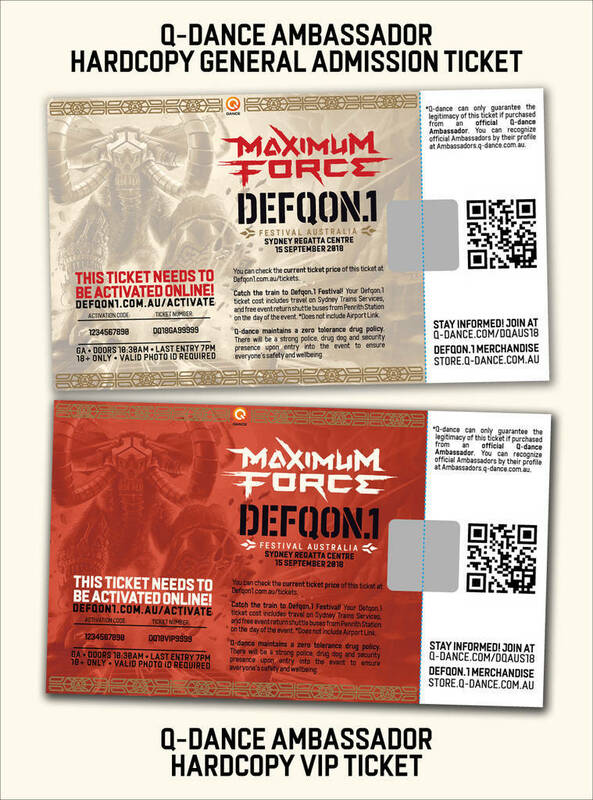 Q-dance does not control the validity of these tickets whatsoever, and chances are likely you are purchasing a duplicate ticket. So please stay away from sites like eBay or Gumtree, as these sites are highly popular amongst so-called scalpers who are trying to steal your well-earned dollars. The ticket hasn’t been activated yet (you can check this HERE). Please complete the activation process before OR at the time/location when you purchase the physical hardcopy ticket from your seller, to guarantee its legitimacy. If the ticket has been activated already, you should have received a name transfer notification from the seller. Please ensure to confirm this transfer, and update the ticket activation details (name, email, password etc.) into your own details before OR at the time/location when you purchase the physical hardcopy ticket from your seller, to guarantee its legitimacy. Please do NOT transfer any funds for secondary hardcopy tickets to a ticket seller, unless you have the ticket in your hands and it meets the above conditions. When meeting up with your ticket seller, please be careful. Meet at a safe location and bring a friend with you for piece of mind. The hardcopy ticket activation system is for your own protection to verify the legitimacy of your hardcopy ticket. Your ticket is only valid if activated! If your ticket number and/or activation code do not work, it means your ticket is invalid. TRAVEL INCLUDED IN YOUR TICKET - CATCH THE TRAIN! Your Defqon.1 ticket cost includes travel on Sydney Trains services, and free event return shuttle buses from Penrith Station on the day of the event. *Does not include Airport Link. Check all the essential travel information here. The full name associated with your ticket must match the full name on the ID presented at the time of entry. Re-issue fee applies. Check the full entry conditions here. Check all ticket purchase terms here. If you are the holder of a companion card or you require special assistance, notification is required via written communication to info@q-dance.com.au, so we can assist you with your booking. Suitable and valid identification must be provided upon request. Written communication needs to be received at least 7 days prior to the event date for your booking requirements to be actioned on. © 2019 Ticketbooth on behalf of Q-dance Australia. All sales are final. Tickets are non-refundable.